Your utility faces day-to-day challenges providing reliable, safe drinking water for your customers while avoiding costly violations. The American Water Works Association (AWWA), in conjunction with the Rural Community Assistance Partnership (RCAP), and the New England Water Works Association (NEWWA) is offering a FREE 1-day workshop to help your utility learn about compliance with drinking water regulations and steps to avoid costly violations. This workshop is made possible by funding through the U.S. EPA and AWWA’s partner, RCAP. Continuing Education Credits – Approved by the NH DES Drinking Water and Groundwater Bureau. AWWA is the entity providing the TCHs for this event. Individual registration is required through NEWWA. Audience: Operators, managers, or governing body of a small system. What topics will be covered at the workshop? Emil Coviello is a water compliance specialist with RCAP Solutions, Inc., for the states of Connecticut, Rhode Island, and Massachusetts, where he is also a certified operator. Emil has 40 years of combined experience in the installation and repair of water, sewer, and drainage systems; operating water treatment plants and distribution systems; and overseeing and performing backflow and cross connection prevention activities. He holds a B.S. in Engineering Technologies from Central CT State University in New Britain, CT.
Daniel Crosby is laboratory director for EAI Analytical Labs. He attained and has maintained the laboratory’s NELAC accreditation for microbiologic and inorganic analyses, and developed and implements the quality assurance and control plan while overseeing the financial, customer service, and marketing aspects of the business. He currently splits his time working with EAI and acting as a radiological decontamination advisor and chemist with Environmental Alternatives, Inc. He holds B.S. degrees in chemistry and geology from Keene State College, a Grade 1 treatment and distribution license in NH, and a Class 3 treatment and distribution license in VT.
Wade Pelham is a member of the Engineering & Survey Section at the New Hampshire Department of Environmental Services’ Drinking Water & Groundwater Bureau. He holds a B.S. in Environmental & Resource Economics from the University of New Hampshire, is a certified Grade 2 Treatment and Distribution operator in NH, and a NEWWA-certified backflow prevention device inspector/tester. Amy Rousseau provides engineering and survey technical assistance with the NHDES DWGB. She started with the bureau in 2014 to provide outreach and assistance to seasonal systems as the Revised Total Coliform Rule came into effect and continues this work with the addition of design review, treatment approval, and the occasional survey. Amy’s background is in environmental engineering with a Master’s degree from Clarkson University. Prior to the DWGB, Amy worked in private consulting, primarily in site remediation of various types, including extensive Superfund work. Click here to down load program flyer and fill out registration form. 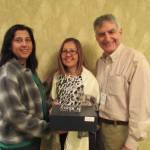 Award recipients Sukhwindar Singh, Josefa Torres-Olivo, and Art Astarita. Robert Stewart with Sukhwindar Singh. 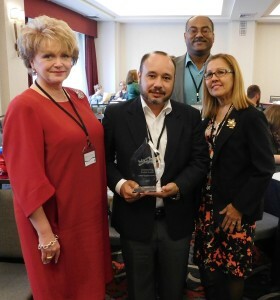 Robert Stewart, Executive Director for the Rural Community Assistance Partnership (RCAP) presented three RCAP Solutions Employees with prestigious national awards during the RCAP annual conference last year in Madison, Wisconsin. 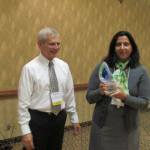 Sukhwindar Singh, Director of Education and Training was inducted into the RCAP National Hall of Fame. 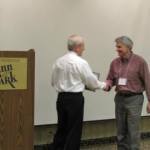 Inductees into the Hall of Fame are recognized for having made significant positive contributions to RCAP in the course of their work over the years as a long-term Technical Assistance Provider or Regional coordinator who works directly with communities. Sukh has been with RCAP Solutions for 21 years and brings unique expertise, training and skills useful in a variety of leadership, training and community settings. She has primary oversight ensuring that all training deliverables/funder requirements are met. Josefa Torres-Olivo with Robert Stewart. 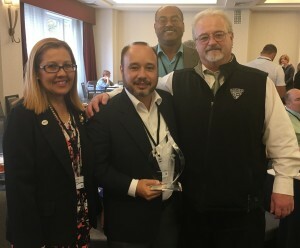 Josefa Torres-Olivo, District Director for Puerto Rico was the recipient of The Bill French Bridge-builder Award, given to an RCAP staff member who has been successful in building their state RCAP program, whether in reputation and credibility or in funding. She has advanced her state program to a higher level of operations through new and enhanced relationships with funding and primacy agencies or other partners, new services offered to communities, and new grants or contracts obtained. This award is named for Bill French, one of RCAP’s founding members who leveraged the RCAP program to build a strong and well-respected agency, and is given to a recipient who has successfully advanced their state program to a higher level of operations. Josefa was recognized for enabling her program to cross over barriers, leading the program along a road to realize its vision, and bringing the plan to fruition. Josefa has been with RCAP Solutions for 20 years, providing technical assistance on water and wastewater issues; assisting in the planning, developing, and organization of rural communities; providing expertise for the implementation of community source water protection and ground water improvement for rural low-income water systems; and has worked cooperatively with local, state, and federal government agencies to enhance community systems compliance. Art Astarita with Robert Stewart. Art Astarita, State Lead for Maine, received The Outstanding Service Award, given to an RCAP staff member who repeatedly goes above and beyond the call of duty in serving his communities, building their capacity and helping them achieve the outcomes that are critical to their future health and development. Art was recognized as a staff member who gives more than 100 percent in the service of his communities and whose commitment and dedication to RCAP’s mission is obvious to all. 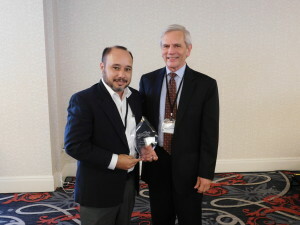 Art is a geologist and joined RCAP Solutions 17 years ago. He provides technical assistance to small water and wastewater systems throughout Maine and New England. This includes environmental assessment reports, GPS and GIS mapping, aquifer contaminate analysis, writing funding applications, grant administration, conducting system financial analysis and asset management training. 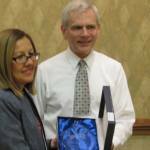 He has helped to secure funding on numerous water and wastewater infrastructure improvement projects. Perhaps one of the most important activities and investments a community can make is providing safe, efficient, and sustainable infrastructure for its residents. In fact for many rural communities a water system or wastewater system can be the single most expensive investment it makes for itself. Along with these also are affordable housing, electricity, safe transportation routes, and telecommunication opportunities. In this day and age many communities are looking at all of these as basics for community life and economic betterment. Without water and wastewater disposal two of the critical elements necessary for a safe and clean community life needed to prosper are missing and due for some challenges. 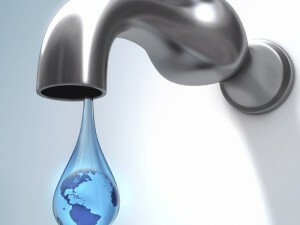 Can you imagine living in a location where there was no drinking water? All these activities require proper planning and a critical understanding of the system to insure that they not only operate correctly but also provide the intended opportunity and or sustainment of a healthy environment. With the availability of water in many of our states coming into question those that do have access to clean water it is becoming more and more, perhaps, one of the most important resources a community has. And they are looking to protect it along with finding ways to sustain its availability and quality. RCAP Solutions has been a long standing leader towards this end in providing such counseling and technical assistance to rural communities across our region which covers 9 north eastern states and 2 territories [ME, NH, VT, MA, CT, RI, NY, PA, NJ Puerto Rico and USVI]. Our experienced staff which is located in each state focuses on assisting those small rural communities in need trying to promote their locality and provide a safe environment to live. Whether it be working with a specific community issue or developing a new infrastructure system they have the experience to assist you with your effort. Most always these are challenging efforts which cost significant dollars and there is an ever growing maze of regulation and process that needs to be navigated. We can help. This year we are pleased to say we have funding available to assist eligible communities. Whether it be direct technical assistance, or training provided to you or your project team, we would enjoy hearing from you and seeing how we may assist. In those cases where communities are not eligible for assistance under our federal and state funding guidelines, we also offer an affordable approach to gaining this assistance and are more than happy to discuss your needs. RCAP Solutions’ experience has shown that small-sized systems (<3300 connections), have a wide-range of ways to document the need for capital improvements. Typically, the superintendent has a list showing improvements including costs that is used to plan proposed upgrades. This “mental list” is generated and updated when events arise but does not contain a comprehensive look at the entire system and its’ financial health. It is not holistic view which is required to assure the system is operated in a long term and responsible manner. Conducting a collaborative infrastructure assessment through an asset management planning process produces a thorough document that can be utilized by the utility* and shared with the town or even regional economic development groups. RCAP Solutions has been conducting asset management processes with five water utilities in Oxford County Maine (Figure 1). These water utilities are relatively close geographically; the largest towns of Mexico and Rumford are separated by a bridge over the Androscoggin River. 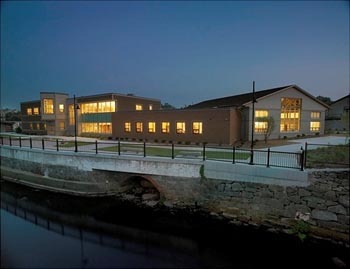 The five towns are part of the nine-town River Valley Region of the Western Maine Economic Development Council (WMEDC-RVR). The River Valley Region has a population of about 13,250. “Public” water is delivered to about 12,000 people or 90% of the WMEDC-RVR population. The drinking water for the residents of the four remaining towns is sourced by private wells. The hub of this region is Rumford, the largest community and home to the largest employer, Canadian based Catalyst Corporation’s Wood Mill. At the end of 2014, the mill employed 800 workers; within 5 months they laid off 50 people. The mill is the critical economic lifeblood of the area. 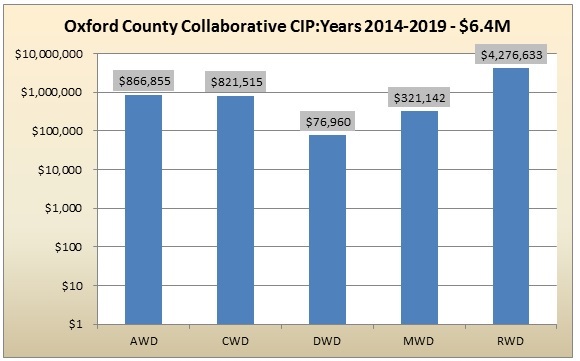 The Rumford Water District* realizes about 30% of their revenue from the mill whereas the surrounding water utilities have many indirect benefits. A study by the Maine State Office of Policy and Management (OPM) of population trends between 2010 and 2030 predict a population decline of 33% WMEDC-RVR (http://maine.gov/economist/projections/index.shtml). Such estimates should weigh heavily on the regions’ towns and possible coping mechanisms should be activity discussed. 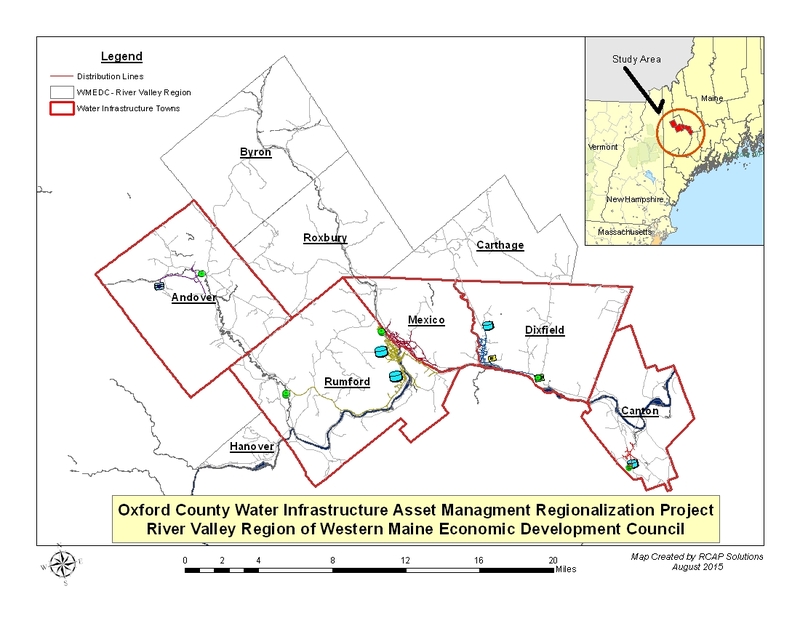 Figure 1: Oxford County Water Infrastructure Asset Management Project showing the five core towns and the four other towns comprising the River Valley Region of the Western Maine Economic Development Council. RCAP Solutions’ project work for Andover and Canton Water Districts included creating a digital map of each system; the other three systems (Dixfield, Mexico, Rumford) already had digital maps. The tables from digital map layers provided a raw inventory for critical water equipment such as hydrants, valves, distribution pipe, source, treatment and storage. Individually, each system carried that inventory into a spreadsheet containing questions including name, location, condition, installation date, life expectancy, criticality of failure and replacement cost. Each utility completed an asset management plan (AMP) using EPA’s CUPSS software. A quick view of each utility is shown in Table 1. Historically, most of the water utilities’ asset replacements, specifically valves and pipes, are driven by the State Department of Transportation and/or towns’ public works schedules. If roads, culverts, sidewalks or bridges are on State or Town schedules for repaving, the water utilities are then consulted. This silo scheduling creates interruptions with the water sectors’ normal replacement plans; it can also lead to replacing assets that have not reached their full useful life expectancy; payment for such pre-spending is the responsibility utility customers or town residents*. Using the asset management process, the utilities can generate a repair/replacement (R&R) cost schedule. Here, items can be grouped by decade or by logical project task(s). This information is perhaps the most important and critical step in reaching effective utility management. This report initializes priority and emphasis on improvement types along with the cost of those upgrades or maintenance activities. The R&R cost schedule is critical, concise and organized. The information can be shared with decision makers overseeing the system, town, region and state. This sharing leads to enhancements to planning infrastructure improvements. Such cooperation will improve cooperation between utilities, towns and state along with sharpening the budget process for everyone. As Table 1 shows, the median household income (MHI) of the project towns are below the state MHI, thus they qualify for grant assistance from increasingly competitive (and dwindling) federal and state programs. Historically, each water utility hires an engineering firm to scope the necessary capital improvements. Individually, they submit funding applications and separately bid-out construction. Consequently, they compete and are “ranked” against each other at two very important projects stages: funding and construction. In this project example, the collective utilities total distribution pipe is 76 miles. The amount of pipe, which generally relates to the amount of total assets, pales when compared to large and very large water systems. Accordingly, if these small, geographically close utilities are treated as “one system”, economies of scale are visible. Hiring one engineering firm for design and one construction company enhanced by bulk purchases of similar pipe, hydrants, valves, etc. could create cost savings on total collaboration-wide project. To demonstrate an example process of collaboration between these five water systems, RCAP Solutions pooled each system’s asset management information into one CUPSS project. The combined analysis shows 2200 assets worth $76.8M; 727 assets are at high risk. The CUPSS software produces a capital improvement schedule which can be exported for spreadsheet analysis. A twenty-year improvement plan in five year increments can be presented. 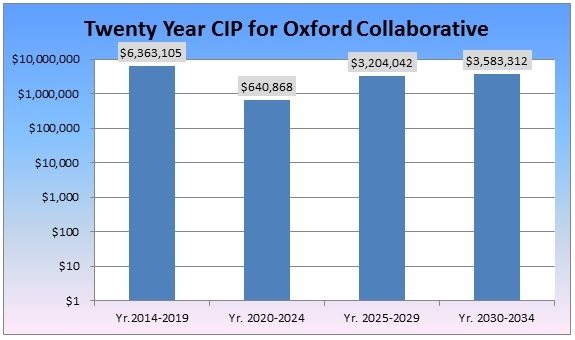 Figure 2 shows the collective twenty-year CIP for the five utilities. These twenty-year expenses represent only 18% of the total collective replacement value. The first ten years of capital costs by utility are shown in Figures, 3 and 4. Granted each system has different scales of improvement costs. Some utilities need to review asset attributes in order to “smooth out” the overly large cost requirements in certain 5-year periods. However, costs to the collaborative are transparency and can be preserved by prorating costs along with factoring the capital expense with each utility’s revenue contribution to the collective. A financial analysis of all five water utilities shows that perhaps jointly, they could accomplish the needed capital improvements. 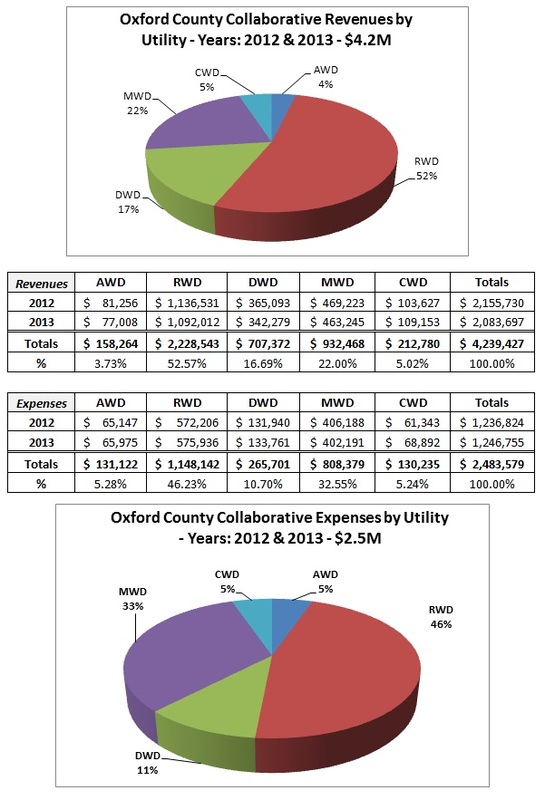 The revenue expenses are shown in the following graphics and tables indicates that for the two year period of 2012 and 2013 there was a collective $1.7M surplus. After individually funding the necessary utility reserves: emergency (~25% of operation expenses), debt service along with replacement of short-term assets (asset with <15 year life expectancy), a portion of a utility’s surplus could be collective pooled for capital improvements to create an economy of scale. Of course, what certain projects are good of collaboration versus unique upgrades specific to an particular utility must be crafted. This collaboration aids the water utilities’ sustainability and helps the economic development of the River Valley Region. Improved infrastructure attracts businesses. Using the existing framework of the WMEDC-RVR can help streamline planning amongst utilities, towns and regional groups. 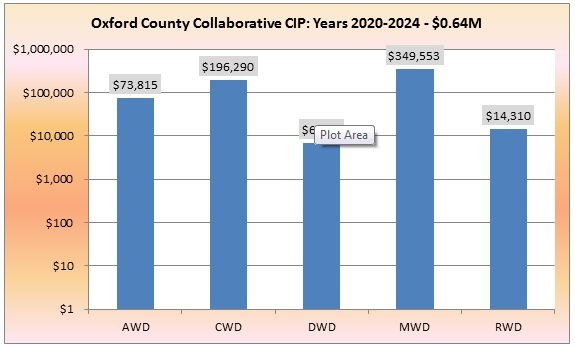 Given the OPM’s declining population projections and one pivotal declining employer in the RVR, it is RCAP’s opinion that the utilities and towns needs to 1) prepare for a lower revenue stream, 2) prudently accomplish as much infrastructure repair/replacement as possible, 3) collaborate in purchases and conducting infrastructure projects and 4) consider consolidating administrative operations. As governmental subsidies decline, it is increasingly becoming apparent that small rural utilities must develop a holistic business plan which focusses on asset management in order to operate the system in a sustainable manner. It is the long-term asset reserve that is financially critical and challenging. However, it seems that individually, no one system can save reserves to significantly “buy down debt” of these expensive capital improvements while keeping customer rates reasonable. If major employers decline, a ripple effect occurs to the revenue available; expenses increase for the ever declining population base. Collectively working together could be a solution. RCAP Solutions staff members were in Washington DC for our annual conference, promoting the work we do in rural communities across the northeast. RCAP Solutions is part of the Rural Community Assistance Partnership, a network of six regional organizations that provide technical assistance and training for water and wastewater systems in small rural communities throughout the U.S. Pictured below is Mia McDonald, Drinking Water Specialist and Brian Scales, Chief Development & Govt. 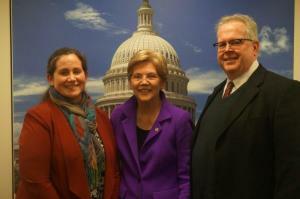 Affairs Officer with Senator Elizabeth Warren. Each year, a contingent of RCAP staff and rural community leaders come to Washington, DC for the RCAP network’s annual Legislative Fly-In. The purpose of the fly-in is to educate members of Congress and the administration about the services that RCAP performs for their rural constituents and remind them of the importance of federal rural development programs. Despite a late-season snowfall that forced the closure of most of the federal government, this March we were able to meet with the offices of more than 100 legislators as well as Congressional committees and federal agencies. The event helped build support on the Hill for rural development programs and for technical assistance for those programs. In the weeks following the fly-in, RCAP circulated a letter in the Senate supporting funding for technical assistance for rural water and wastewater systems that was signed by a bipartisan group of 12 Senators. A similar letter in the House of Representatives garnered 42 signatures from across the political spectrum. As Congress contemplates funding bills later this year, this strong show of support across party lines will help to ensure that funding for these programs continues. Throughout the week members of Congress and their staff expressed the desire to hear more about how RCAP and federal community development programs are helping their constituents. In order to maintain support for these programs, it is imperative legislators continue to hear how they benefit the people they represent, and Congressional recesses provide a great opportunity to do so. Every few weeks, Congress is out of session so they can return to their home states and spend time visiting and meeting with constituents. These breaks are a great time to reach out to your Senators and Representative to try to schedule them for a visit to your community. Groundbreakings and ribbon-cutting ceremonies provide great opportunities for photo-ops which members of Congress love, and which give them an opportunity to learn about the great work that is being done throughout rural America as a result of the federal programs that they oversee. Even if you’re not planning a big event, your legislators may be interested to see the improvements your community has made as a result of the availability of water or wastewater service. Showing them the value of these programs to rural America will help keep our communities front of mind when they return to Washington and will generate support for our projects and programs. The Glendale Water Association is a small, private water supplier that consists of one well, one pump and thirty residential service connections in a small neighborhood in Glendale, a village of Burrillville, Rhode Island. The homes and water system were originally constructed in the 1950s by the U.S. Army as housing for the military families. It is now managed by the Association, whose members are composed of resident volunteers. A recent change in board membership left the remaining and new members to inherit a failing well pump, broken backup generator and a current rate structure that cannot support the needs of the system. A crash course in sampling protocol got the system the attention of the Rhode Island Department of Public Health, who directed RCAP Solutions to assist the system. RCAP Solutions Specialists are working to assist the system to achieve compliance and get connected with the resources to successfully manage the system going forward. They have facilitated multiple meetings between the board, primacy and residents to repair the well pump and obtain an evaluation of the current status and future needs of the system. RCAP Specialists will continue to work with the Glendale Water Association in planning for asset management and with a restructure of the rate system. Due to the ongoing relationship between RCAP Solutions and the Glendale Water Association, RCAP was able to assist when a time-intensive waiver application came due. As volunteer board members have full lives outside of their board responsibilities, it became apparent they did not have the time or resources to complete the required Synthetic Organic Chemicals Waiver Application required by the Rhode Island Department of Public Health. The Association was already actively working with an RCAP Solutions Drinking Water Specialist, who was able to spend the time needed to map land uses and conduct landowner outreach to determine which chemicals are in use in Glendale’s wellhead protection area. RCAP Solutions is continuing to work with the Rhode Island Department of Health and the Department of Environmental Management to finalize the sampling requirements for the next three years for the system. Once determined, these requirements and their associated costs shall be incorporate into the new rate structure. If the waiver is not completed, water systems are then required to complete the full range of sampling with no waiver, in some cases up to $625 per quarter for small systems. It is the long term relationship with these rural water systems that allows RCAP Solutions Community Resource team members accomplish long term, sustainable results. 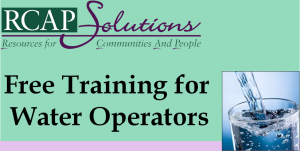 In Need of Training Contact Hours? 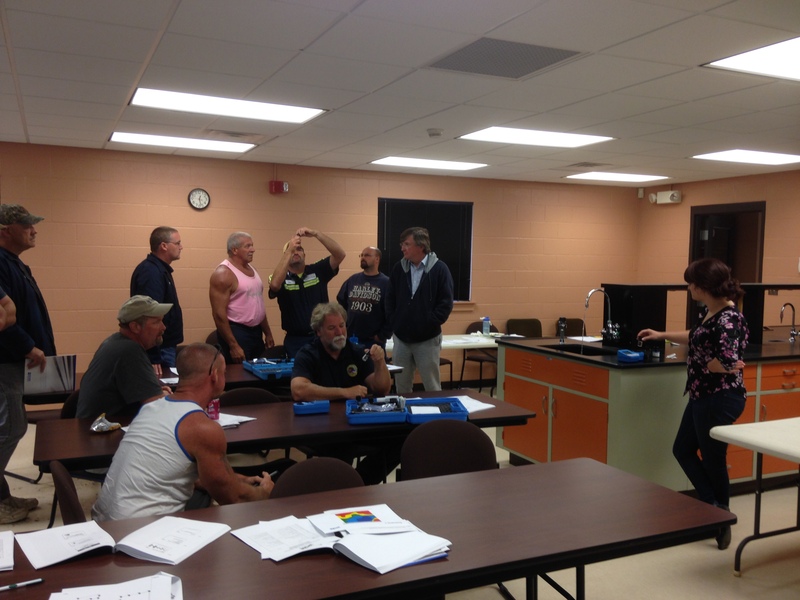 The courses are accredited by the RI Department of HEALTH and will provide water operators with 4 Training Contact Hours per course. Register for one or both today! Mia McDonald, RCAP Solutions, Inc.
RCAP Solutions is funded by the U.S. EPA through a grant to the Rural Community Assistance Partnership (RCAP), a non-profit organization that provides free technical assistance to rural water and wastewater communities. RCAP Solutions is a regional affiliate of RCAP. For more info, click here.